Since its founding in 1979, New York label Adrianna Papell has become synonymous with wearable, accessible luxury that makes every woman feel beautiful. Offering highly sought-after collections of ready-to-wear apparel, the label nods to modern silhouettes and trends while remaining committed to timelessly elegant womenswear style. 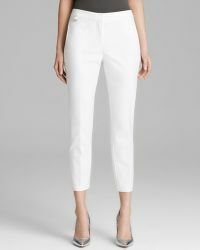 For the chicest addition to your office wardrobe, look to the latest styles of Adrianna Papell trousers. Immaculately crafted with a meticulous attention to detail, expect the highest quality and most sumptuous designs from this illustrious brand.